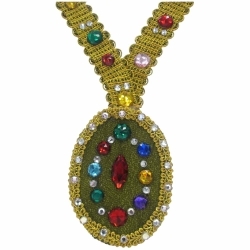 This chain of office is on a gold trimmed necklace with a gold oval centerpiece trimmed with jewels. It is worn with Medieval and Renaissance royalty outfits as well as ambassadors and any costume needing to show rank or station. For example, this piece works very well for both Arthur and Guinevere in "Camelot".